Beginning the trek from Nayapul which can be reached after a drive of about 45 minutes from Pokhara city. The trail passes over the Ghorepani and descends down to Kali Gandaki valley. The views from the first rays of the sun at the break of dawn grace the pinnacles of Dhaulagiri and Annapurna . The trek takes you along the Kali Gandaki by traversing beautifull villages such as Marpha and jomsom (the head quarter city of Mustang district where you will take a flight to back to Pokhara), Muktinath on the border of Mustang, which is popularly known as the Himalayan Shangri-la. As you hike through the Kali Gandaki Valley , passing through the deepest gorge in the world; the trek finally emerges into the wide valley of Jomsom , a Himalayan Shangri-la. 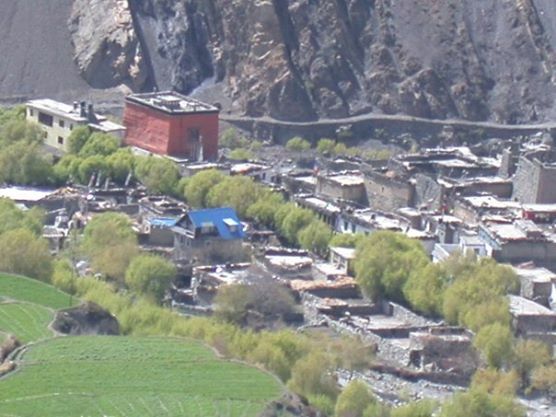 Once you reach Jomsom you can either trek to the famous Muktinath temple [ Temple of Lord Vishnu ] at 3810 meter or explore the fascinating villages around Jomsom. This is an easy trek that can be done any time of the year except during the monsoons.